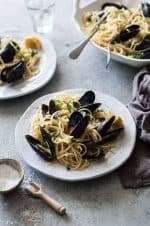 This simple and easy baked mussels recipe is clean eating AND its one of the little indulgences that I make for a special treat once in a while. Have you seen the bags of mussels at Costco or the grocery and been intrigued but had no idea how to cook them? Did you think an easy baked mussels recipe was impossible? Well, don’t be intimated anymore! Mussels are just about my favorite indulgence in the world and as a side benefit – they are super-easy to cook! I’m the only one in my family that likes these – so I don’t suppose they are very child-friendly – but I REALLY like them. I make them for a treat for myself when the rest of my family wants to eat something I’m allergic to or wouldn’t touch with a ten-foot pole – like something with preservatives. Yes – I’m a food snob. Sorry, but I don’t eat preservatives and I make food that I like and that’s healthy even if it means more work and/or money. Having joy and being healthy is too hard for me to put a price on. The good thing about that for you is that I’ve invented lots of yummy, easy, healthy recipes that I can share with you! Make sure to follow the directions. I know it’s kind of weird to put this, but it’s important with this recipe. Like, it may seem unnecessary to soak them or throw away open ones or cover the pan with foil, but those are all important things. If one is cracked, you have to throw it away. If they are open, try squeezing it closed with your hand a few times first. Lots of times that sort of wakes up the mussel and it will close on its own. It’s important to discard the mussels that didn’t open because, if I remember right, they were dead before you cooked them and they could make you sick. I’ve also added heavy cream and/or Parmesan cheese to this recipe and it makes them really rice and good. I just add the cream to the pan and grate the Parmesan cheese over the pasta when it’s done. You can use this same recipe and leave out the butter and substitute spaghetti sauce. Personally, I’m on a high protein/low carb diet and I eat about 1/2 a pound of mussels myself and way less pasta than this. 1/2 a pound may sound like a lot, but most of the weight is shells, but it’s really not that much protein. These easy Clean Eating baked mussels are so good and simple and seem so fancy. They are my favorite meal I make at home. I love to make these when I’m sick of chicken and want something different. Preheat the oven to 450 degrees. Place the mussels in a large bowl of water and let soak for 10 minutes. Swirl mussels around in the water to remove sediment. Pull the beards out of the mussels and throw away any that are cracked or open. Drain the mussels. Place the clean mussels in a 9×13” baking pan. Sprinkle the garlic slices and salt over the mussels and drizzle the olive oil over them, as well. Place the cubes of butter in the pan, evenly scattered over the mussels. Cover the pan tightly with foil. Bake in the preheated oven for 12-15 minutes. 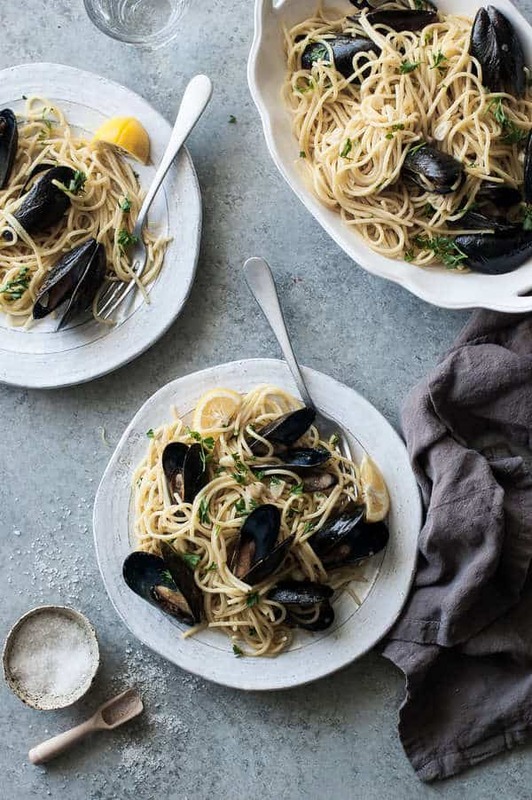 Cook your pasta while the mussels are baking. When the mussels have finished cooking, remove from the oven, carefully remove foil, and discard any mussels that did not open. 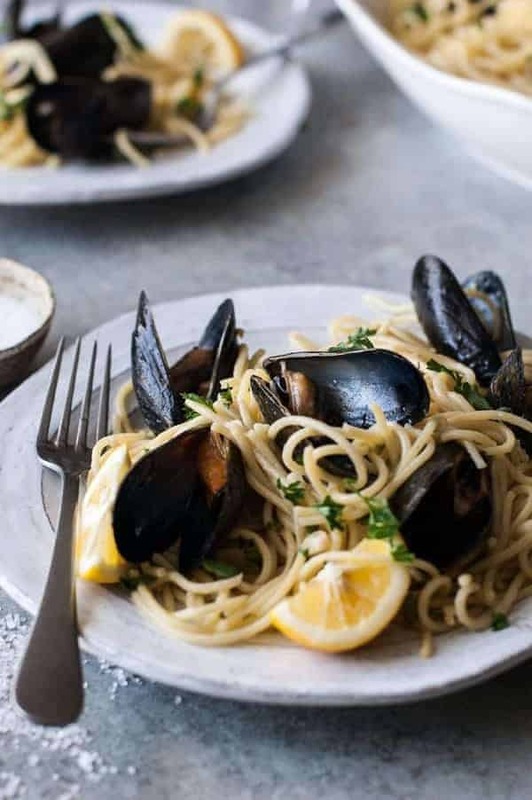 Drain the cooked pasta and place it directly in the pan with the mussels. Add the parsley. Toss until noodles coated in the butter/oil mixture. 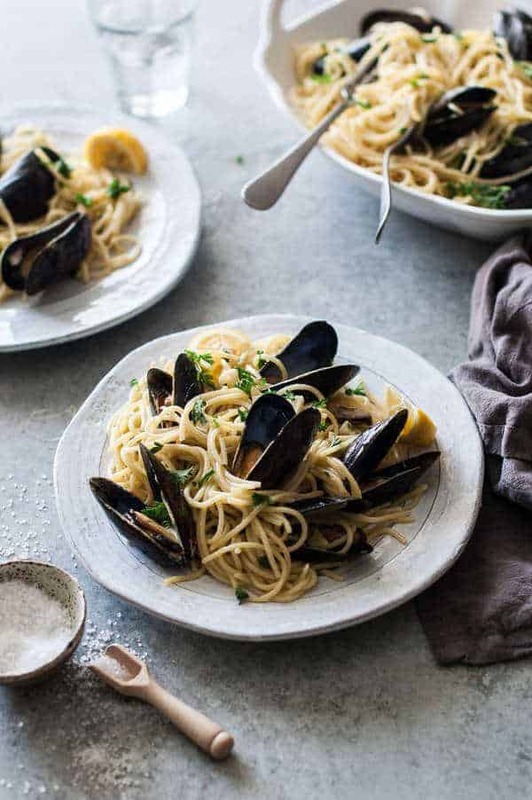 Alternately – you can remove the mussels from the shells and discard the shells before tossing with the pasta. Are you going to try this baked mussels recipe? Any suggestions for a gluten free version? It would be very easy to use store-bought gluten-free spaghetti. The rest of the recipe is gluten-free naturally. I love mussels, too! You mentioned that you should discard raw mussels that don’t close when coaxed, but did you know that if they don’t open when cooked you should discard those, too? Also, I can’t remember where I learned this, but you don’t need two forks to get the mussels out of their shells: use the mussel shells themselves as little tongs to grab the “meat” by just pinching on the shells. Awesome tip about using the shells! Yes, I should have mentioned that you discard that ones that don’t open.